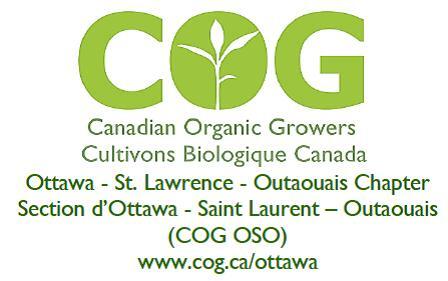 This survey is a project of the Ottawa–St Lawrence–Outaouais Chapter of Canadian Organic Growers (COG OSO). Canadian Organic Growers (COG) is a national charitable organization representing farmers, gardeners, processors, retailers, consumers, and supporters of sustainable agricultural products. All farmers are encouraged to complete this survey, regardless of whether or not they follow organic practices. The survey takes about 30 minutes, and should be completed by the person managing the land, who may not necessarily be the land owner. As a token of our appreciation for completing the survey, three respondents will be chosen at random to receive a free gift from COG OSO. Please take the time to answer the questions thoroughly. The survey is an important opportunity for you to express your views about organic agriculture and the work of our Farmer Outreach and Training programming. Your responses will strategically guide the future our Farmer Outreach and Training programming. Our activities will better reflect your stated needs, will be more relevant to, and better serve, the farming community in Eastern Ontario and Western Quebec. You will not be identified in any reports based on the analysis of results, as these reports will be based only on aggregated responses. Your personal information will not be shared without your explicit permission. Questions and comments about this survey and COG OSO can be addressed to Colin Lundy, COG OSO Farmer Outreach Coordinator, by calling 613-493-0020 or emailing colin@cog.ca . This survey is made possible with a grant from the Ontario Trillium Foundation.